Number 2 makes no sense to me in that the phones are all identically priced where I live. It's roughly 200 bucks for a smartphone from all the carriers in my area whether you pick Android or iPhone. It's not simply about cost at point of purchase, but cost after purchase. Yeah, that's exactly what I wonder too when I buy ANY product, .. How much does the manufacture make? I'm going out shopping for a new boat and kitchen cabinets. Since I now know what is really important, can you advise me what companies that manufacture boats and cabinets make the most money? Then it shouldn't matter which company has more or less marketshare over a particular aspect of a complete product, thereby any post over the OS marketshare pointless. 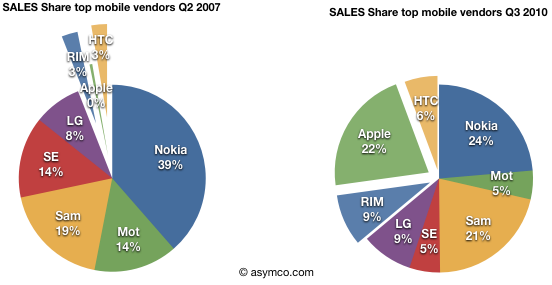 I posted the following charts from Asymco (one of the best AAPL analysis sites on the net) on another thread about Apple becoming the number 4 handset (not just smartphones) vendor in the world but I'll post them here again. This whole iOS vs. Android "war" needs to be viewed from a wider perspective than just number of units shipped. It may seem like all these Android phone makers are in an alliance to take on Apple, but the truth is that they're beating up on each other to a pulp with much lower margins than Apple and giving away phones to merely gain units market share. It's no wonder Google uses the term "activation" instead of units actually sold. There's another interesting article from Asymco titled 'Android's Pursuit of the Biggest Losers' that needs to be read to gain the bigger perspective on all of this. In the last quarter, let's consider that Motorola sold 9.1 million phones (3.8 million smartphones) and turned a paltry profit of $3 million. Sure, Motorola apparently has other internal problems because we can safely assume that the likes of Samsung and HTC are making more per smartphone than Motorola, but this still brings up the point that it's a race to the bottom for the Android handset makers. In reality, the Android phone makers are competing more with each other than they are with the iPhone. One more Droid sold means one less Evo or Captivate and vice versa as well as one less iPhone or a Symbian phone or a RIM. There's a good reason why Nokia won't adopt the Android, why Samsung is also adopting the WP7 and developing their own OS/platform called Bada, and why HP also refused to take on Android and acquire Palm's webOS. These giants looked at Android long-term and decided that Android is a losing proposition - revenue-wise and profit-wise. It also seems LG, the world's third largest handset maker, has also decided to focus on WP7 rather than Android. Samsung and HTC are also offering WP7 phones, further scattering their development, manufacturing, and marketing resources and pulling away their focus from Android. On top of this, these upper tier phone vendors have to look over their shoulders and cast their wary eyes on the coming flood of super cheap Android phones from a horde of smaller phone makers in China, India and other developing nations. With dozens, perhaps hundreds, of phone makers all offering various versions of Android with their own UI's and features, the fragmentation and the ensuing chaos won't be a pretty sight. Let's remember these "other" phone makers that we've never heard of are already producing well over 300 million phones per year. We all know that all cellphones will eventually become smartphones in the years ahead. Well, since Android is free, you can expect every phone maker in the third world to adopt it as well. Without a doubt, Android will become the de facto standard third world phone unless Nokia can somehow stem the tide. But that seems rather unlikely. The governments in China and India will give their local phone manufacturers favorable terms so they can dominate the local markets. The affluent and the growing middle class in these countries will go for the brand and differentiated products and ecosystem. Yes, they'll want Apple and will gladly pay a lot more for one. 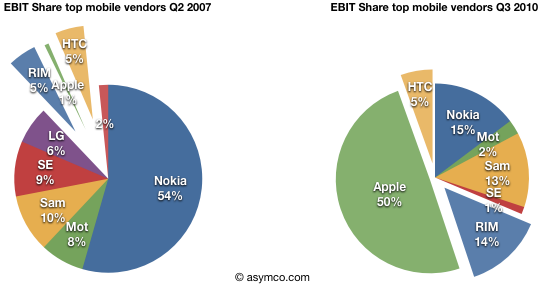 And the likes of HP, Samsung, LG, RIM, and Nokia want to be where Apple is at, not where things are going with Android. They look at Android and see that it benefits no one except Google in a roundabout way - more ad hits to generate Google's ad revenues. They have no desire to compete with the coming flood of cheap Android phones from these no-name phone makers based in the third world. After all, it's about making money, not a charity. ...what happens when Windows 7 mobile eats into Android's market share leaving Apple's untouched, and Apple launches with multiple carriers in the US. I think OHA will be an interesting thing to watch, from the perspective of what competition will do to price, what price will do to quality, and what quality will do to churn. Meanwhile, Apple can continue to differentiate, command a premium, and add new carriers when they want. RIM has about a dozen different models, not the 60+ that Android offers. Not in the US ! And elsewhere Symbian does still dominate. I see no correlation between the variety of handsets on an OS and the dominance of the OS. Honestly, how much market share do you think Android would have if there were only 6 instead of 60 different models? Indeed, iOS once dominated despite its lack of hardware variety. iOS has never dominated (or been number 1) in any market. Android's dominance of the smartphone market is for other reasons, including, but not limited to, the fact that most people like it better than the other OS choices. Well according to the OP, "most people" are actually choosing something else. Just how much can you get wrong in one short post? I think you were right about #1 LAST year, but not this year. Many, if not most, people on Verizon don't even care about iPHone anymore. Android does so much more than any iteration of iPhone. And, if you read the article, Android is growing as fast as hell on carriers worldwide where the iPhone is also offered. The U.S. is now only 1 of 2 remaining countries worldwide that has an exclusive agreement that shuts out other carriers. Android is clobbering iPhone there. I say it's all good because it's forcing Apple to create even better iPhones and, in turn, this forces the Android makers to make even better phones. It's a win-win for the consumer. And, as for #2, high-end Android devices run as high as $250, so it's not about being able to afford or not afford an iPhone. Actually, the OP states that the iPhone is the most popular phone, since there's really only 1 "iPhone" (different models, though). And Android as an OS is being picked more. All this really means is that there's a greater variety of smartphones running the Android OS than the iPhone. Sixty different Android models? Surely, you jest. There are currently 26 models in the U.S., which offers the most of any country. Most countries offer only a few. And, couple that argument with the fact that the iPhone comes in many different models as well: iPHone, iPHone 3G, iPhone 3GS, iPhone 4, plus all the different sizes, 8gb, 16gb, etc. etc. You're missing the big point here: Android is cutting into Apple's profits, or, at the very least, it will be. Free, reduced, or at full price, Android is selling and selling very well. What Apple thought was a market it had and was going to dominate for many years to come has now been slowed to a disheartening rate for Apple's taste. Why else would Jobs blast Android as much as he has? 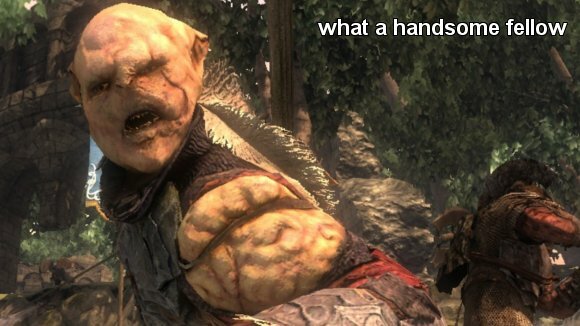 He's worried! Cutting into Apple's profits when iPhone sales grew 91% year-over-year while the profits grew 70% year-over-year to $4.3 billion last quarter? Please name one phone vendor that is even close to how Apple is doing. Apple still can't keep up with the demand and they've only now just released the iPhone 4 in China and many other countries around the world while they tried to keep up with the demand in the US. And the Verizon iPhone will come eventually. Jobs isn't worried. He's just having fun trash-talking the competition that trash-talks Apple. I'd say all the Android trolls (and I'm not saying you're one of them) are the desperate worried ones to come over to Apple-related sites (many others besides this one) and spend their "valuable" time and effort trashing Apple and the iPhone. I will say if you have a Mac already, don't bother with Android. Feel free to try it out, but when you do get an iPhone, you will probably regret the time spent with Android. Just my prediction. Admittedly I haven't spent more than five minutes each with several Android phones and tablets over the past year, but, there's nothing compelling in it beyond the first few seconds of Wow! Shiny! So you readily admit that your opinion is not credible because you only spent 5 minutes with several Android devices? I am a Mac owner. And I have a Nexus One. Here's why I went Android. 1) Usability. I want widgets. I don't want to have open a dozen apps to get information. 2) Fully integrated with Google's services. GMail, Maps, Search, Contacts, Calendar. A cloud solution that I don't have to pay for. 3) Navigation. Given that I don't really go off-roading too much, Google Maps Nav does the job, does it well, for the right price: free. How much would I be paying Tom Tom every year on the iPhone? 4) iTunes. I just don't want to have to use it. I don't want to have to plug in my phone at all. I like iTunes to listen to music on my Mac. But I don't want to have to plug in and use that to manage my phone. The only times I plug in now is to transfer content. And even that can be done by Bluetooth most often. I like the freedom. I don't even travel with a laptop anymore. Just the phone. All that's not to argue that Android is perfect, or that it's better or worse than the iPhone. But how about throwing out an educated opinion acknowleding that Android might be a good solution for some and not some self-admittedly ignorant tripe suggesting that every Mac user is better off with an iPhone? In my extended family, there's 5 Mac users. Out of those 5, 2 are iPhone users (one of whom is waiting to go WP7), one Blackberry user, one Symbian user and me. And in each of those cases, I'd argue the person got the device that best suited their needs, budget, etc. "The Age of Windows is over. The Time of Android has come." I'd be willing to predict that within 2 years in the market Microsoft will have a bigger market-share than Google in the Smartphone business. However well Microsoft performs in mobile, and whatever problems might befall Android that lead is going to take more than a couple of years to disappear. I wonder how you can be so sure that WP7 won't hurt the iPhone. To start with, in the USA, WP7 isn't even launching on the biggest Android pusher: Verizon. Next, I would argue that WP7 has taken the iPhone's biggest selling point (usability) to it's ultimate extreme. Nice big buttons on a nice big homescreen that do exactly what the picture says they'll do. I can see that kind of device being very popular...particularly with older folks. It's exactly the phone I'd buy my 60 year old parents. And that comes on top of solid brand recognition. Who doesn't know Windows or Outlook or Word or Excel? And heck, many of those older folks still use Hotmail. I am not saying that WP7 will necessarily eat into the iPhone. But I fail to see how the iPhone can be written off as automatically immune to the impact of the Windows Phone 7 launch while everybody else is doomed to defeat the hands of Microsoft's latest creation. That's presumptuous. But this is OK. Microsoft is moving in to reclaim lost territory on Google, Google doesn't have a coherent strategy for supporting Android, just keep moving forward and hope no one notices the "bodies" piling up behind. Microsoft recognizes this. They have begun the reclamation by either suing, or threatening to sue the handset makers for touch interface IP violations and requiring either capitulation or licensing. Which immediate moves Android from "free" for the handset makers to potential liability. Then Microsoft can cut a nice deal with them for producing WinP7 devices and begin eroding Android. All the while misdirecting everyone with "Apple is our competition" statements. Microsoft wants to cut off Android in the consumer marketplace, and RIM/BB in the corporate marketplace. Google's response to this will be EOL Android development as an active strategy and supplant it with ChromeOS, for handheld devices. Thus completely switching tracks and staving off any direct impact to their mobile ad business by competition. It becomes initially additive, where they have both - growing CHromeOS and letting Android ride it out and then off into the sunset. What is the ASP of a typical Android handset? In Nokia's recent quarter they said their asp for 'smart phones' was $ 190.00.